Yes. It's all vector-based and scales up (and down) beautifully. colin@loomer wrote: Yes. It's all vector-based and scales up (and down) beautifully. So what about the audio examples , please ? Bump , any audio examples yet ? Sure. The only visual tweak probably worth noting since the last time I posted is that the loops now work differently, in that they can wrap around the last step and first steps. Behind the scenes though there have been a lot of transport improvements and fixes on these, though: a couple more direction modes, reverse alternate, and reverse pendulum, that mirror the current alternate and pendulum, but backwards; and much needed flexibility when it comes to setting the current playing step via inlet modulation. I've not got video capture set up on any of my machines, but I will look into re-installing said software when I get a gap. Anything in particular you want to see a video of, or would just me noodling around and creating something from scratch be fine? WOW! Looks very good! Complex, with being to complicated. 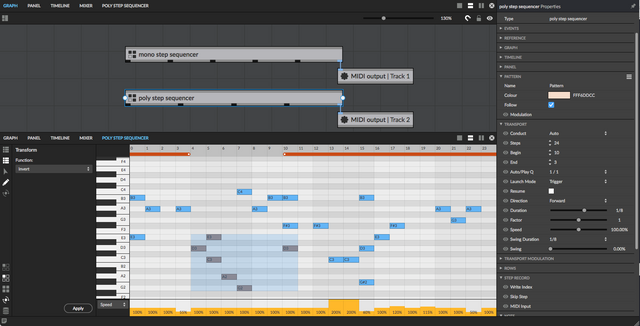 From what I remember reading, its kind of like a massive step sequencer, and hosts VSTs? And similarities to say, Reaktor? 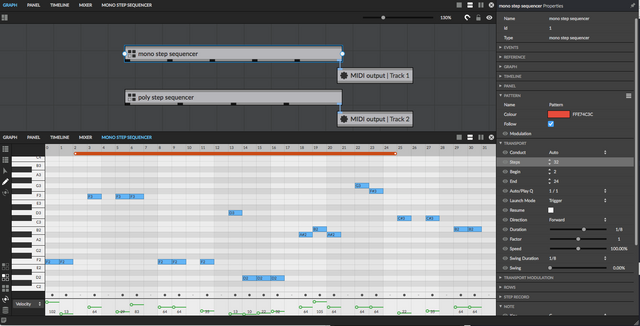 Yes; it's a modular MIDI toolkit, so Reaktor-like, but perhaps more 'programmer-friendly' in that it supports structured data types and is scriptable, and as you say, it hosts other plug-ins. Colin why did you decide to expand it into a behemoth, what inspired that, instead of just completing the vision you had at the beginning? It surely must've been quite an odyssey for you personally, from 2012 till now. The first version that I had nearly completed just didn't cut the ice. There were a handful of elements that, if redone properly, would have vastly expand the possibilities. And they did! Sure, it's been a slog, but a largely enjoyable one, if only for my own personal development, the fact that I began as a coder who probably didn't have the skills to build this, and ended up becoming one who could! @ colin ...found some time to give us some audio examples / short walktrough . I've been mad busy fixing issues with the live play UI, which I believe is the only component that I haven't revealed yet. As usual, these things take longer than I could have guessed, but I hope to have some additional screenshots and an information dump soon (ie, next few days). As for audio examples, turns out I'm terrible at making audio demos, but I'll see if I can get someone who isn't so awful at them to make something typically Architect. colin@loomer wrote: I'll see if I can get someone who isn't so awful at them to make something typically Architect. Terrific idea! If she can also make a video live-playing her creation, we can better understand the workflow. Only audio examples that's trying to impress is pretty pointless imo. No matter the tools its still the person behind it that make the music. A video walk through showing the basic workflow and navigation would be interesting. The getting started videos of Cirklon is a good example. starla* wrote: Only audio examples that's trying to impress is pretty pointless imo. No matter the tools its still the person behind it that make the music. That's a good point, thanks. I'll check out the Cirklon videos. Sure we don't expect a musical masterpiece .